Though best remembered for her role as the vampire Maurella on TV’s “True Blood” and as ballerina Galina in the film “Black Swan,” Hawaiian-born actress Kristina Anapau has played oodles of different and very versatile roles since making her film debut as a teenager in 1997’s “Escape from Atlantis.” Kristina’s most recent role is in a movie called “Kuleana” which was shot and is set in her native Hawaii. The movie tells of a disabled Vietnam vet who rediscovers the brave warrior that lives within in an effort to help his family and defend their land. The movie is set for a release in the United States and Hawaii at the end of March 2018. Kristina recently took the time to discuss her role and her career via an exclusive interview. 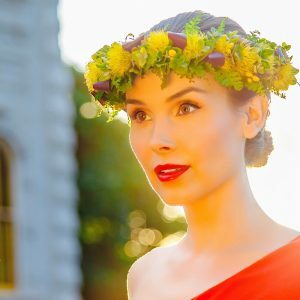 Meagan Meehan (MM) of Movie Vine: It is great to see so many fantastic Hawaiian actors taking off in Hollywood! Are the others friendly competition and do you all know each other? Kristina Anapau (KA): It is, I think there is something about being from an island that eradicates the usual cutthroat, competitiveness in actors – and in people in general! Perhaps it’s a subconscious knowing that everyone in the village supports the survival of everyone else – and Hawaii has much more of a village mentality than the mainland does. We are really nice people, so yes, I do know quite a few actors from Hawaii here in LA, and we are all very supportive of one another – even to the extent of getting each other jobs when we can! I just did one today in fact (Mahalo Matt Corboy!) That is definitely not something I have never experienced with other actors here in LA. MM: What inspired you to seek the life of an actress? KA: Well, I never wanted to be an actress – I was a classical ballerina, had my sights set on getting into a company, and was very focused on academia as well. I graduated from high school early at age fifteen and began studying at University of Hawaii that same year – taking a double course load with plans to have my PhD by age twenty-one. I booked that first film mid-semester of my sophomore year and was in LA and New York working nonstop shortly thereafter. MM: Can you remember where and when you were when you were hired for “Kuleana”? KA: The director of “Kuleana,” Brian Kohne, and I first met back in 2011 at The Big Island Film Festival. I was receiving an achievement award, and his film had just won the grand jury prize. He sent me an earlier version of the “Kuleana” script and I knew right away that I had to be a part of this beautiful film. That initial script was so moving, and to see it evolve over the next few years into the one that we shot with was incredible. With each draft, I remember thinking that it couldn’t get any better, but it did – Brian put his heart and soul into this project and the result is breathtaking. MM: What did you know about the subject before signing on for the movie? Were you down with the topics discussed in the movie – who owns the land etc. – before filming, or did the director have to bring you up to speed? KA: “Kuleana” was definitely an education in Hawaiian history for me. In 1971, when the film takes place, the ‘Hawaiian Renaissance’ still had not happened – meaning ancient Hawaiian values and customs were near extinction, Hawaiian was no longer taught in schools, etc. It’s certainly one of the most meaningful projects that I have had the privilege to be a part of. Collaborating with Brian has been an incredible experience – he had a very clear vision for what he was creating, and really loves every step of that creative process. You can’t help but be inspired to delve in to that experience with him – it was such a pleasure to help bring his vision to life. MM: How does your character, Rose, factor into the story and are you like her at all? KA: Rose loves her adopted daughter (played by Kealani Warner) very much and would gladly sacrifice herself to protect her. I think it’s that sacrificial nature that drives so much of who she is in the film. In certain aspects, she’s resigned to her life – to her unhappiness – but there is an undeniable strength and almost other-worldliness in her that surfaces throughout. I saw a lot of myself in the character, which made for a wonderful, explorative journey while preparing. I’ve always felt that it’s more the roles that are choosing you rather than the other way around. There always seems to be some aspect of myself that gets explored during the preparation and filming process that needed to be examined somehow – and would not have been if not for that role. MM: How was it working back in your native Hawaii and how different was it from filming “True Blood”? KA: Well, it’s always wonderful to go home. I grew up on the Big Island (we filmed on Maui), so it’s great to have a professional reason to be there for that long a period of time. We filmed in some incredible locations. Iao Valley was amazing, although there were a lot of mosquitos! But it was worth it! “True Blood” was shot in Los Angeles – which was wonderful as well. It’s always so fun to film on location, but I think If I had to choose, I prefer filming in LA and getting to sleep in my own bed every night! TV and Film have their respective pleasures and challenges. It’s a vastly different experience – the pace of television is much quicker – you are left to your own devices, to a great extent, when it comes to preparation and shaping your character. Film is a much more collaborative process as far as preparation goes, or at least it can be. It was on “Kuleana.” The role of the director is much different in film than on a TV show, and that always plays a big part in the creative process for me. MM: Do you keep in touch with any of your “True Blood” co-stars? KA: I have kept in touch with Chris Bauer, who is wonderful. We had some of the most enjoyable, creative, esoteric conversations before/about some of our scenes on “True Blood” – he’s a true artist and it is always incredibly inspiring to work with someone like that. MM: Have you a dream role and where do you want to be in ten years from an acting standpoint? KA: I would love to do an English period project – or anything having to do with ancient Egypt. During the last few years, I’ve been very focused on writing and producing. So, I suppose my answer is that in ten years I would like to have created some incredible projects that elevate and inspire. This past year, I co-created and am producing a kid’s show with award-winning talk show host John Kerwin. It’s basically “The Tonight Show for kids.” We had all the stars from Disney, Nickelodeon, and more – these young stars have huge followings, but there weren’t any glamorous, late-night style platforms for them. So, we created one. Kids in the audience. It’s a lot of fun. The show has been airing nationwide on DirecTv and is doing really well. So well, in fact, that we are in the final stages of doing a deal with a much bigger network – that acquisition will be officially announced in a few weeks. Follow us on Instagram @johnkerwinkidsshow to find out more! MM: As an established actress, what words of advice can you offer to those who are seeking a job as an actor? KA: That’s always the million-dollar question isn’t it? There are so many ways to break in to the business, it’s hard to lay down just one formula. I could say, study, network, pound the pavement, etc., and while all those things are necessary, so much of success in this industry just has to do with luck. Being in the right place at the right time. But one can certainly court luck; you court it by looking for it and by being very prepared in every other way so that you are as polished and ready as possible when you find it…or when it finds you, rather! To learn more about Kristina, visit her official IMDb and the movie’s website and Facebook. Photography by Adi Ell-Ad of ADIWOOD Studios, Makeup/Hair by Luisa Ascensao, BTS shot on beach: Jack Grace. Comments for Vampire, ballerinas, and more: Interview with actress Kristina Anapau are now closed.